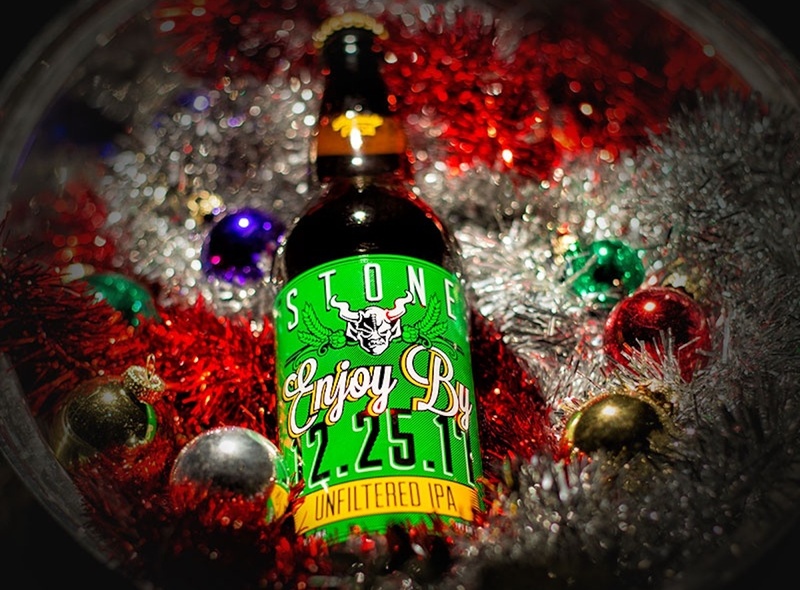 Enjoy By 12.25.17 is the next beer in Stone Brewing’s line of “Enjoy By” beers. These beers are brewed specifically not to last. Stone Brewing has sent a very clear message in the name of the beer itself — Enjoy By 12.25.17 — there really is no better time than right NOW to enjoy this brew. Stone Brewing has gone to great measures to ensure that hopheads get their hands on this double IPA as soon as possible. For the newest beer in the series Stone Brewing thought: “We don’t always have a filter, so why should our beer?” This special brew was made by skipping a step and letting this double IPA go unfiltered. You’d think that skipping a step would be a bad thing and in most cases you would be right. Not this time. Stone Brewing has left out the part where they filter out the extra yeast, hop sediment, and proteins that build up during the brewing process. Because this beer is unfiltered, this golden beer becomes hazy and has intense aromas of peach and tropical fruits. Enjoy by 12.25.17 will be available on draft, 12 ounce can six-packs and 22 ounce bottles. And like all the other IPAs in this series, this version is brewed specifically not to last! For more information about Stone Brewing’s Enjoy By series, check out their official website.